which has been occupied for over 1000 years; held by the Luttrell family for 600 years. water mill, mentioned in the Domesday Book in 1086, reconstructed in 1779. 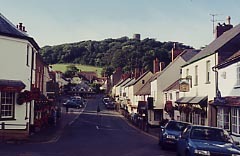 Dunster, the jewel in the crown of Exmoor, offers universal appeal in all seasons, a wealth of history and infinite variety. 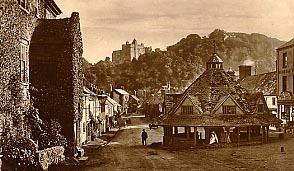 Dunster Castle and village as it looked many years ago. Its historic eight-gabled Yarn Market was built in 1609 by George Luttrell for the sale of renowned Dunster cloth. 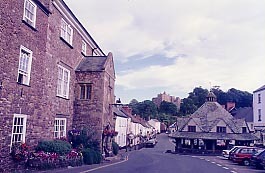 High Street, as it looks today (1997), maintains the picturesque tranquility of an unspoiled medieval village. The Yarn Market sits opposite The Luttrell Arms Hotel. 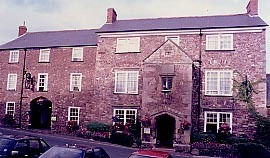 The Luttrell Arms Hotel, whose oldest section dates from 1443 was used by the Luttrell family as a guesthouse for the Abbots of Cleeve. 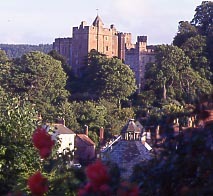 Today it offers a perfect setting for rest and relaxation of the Dunster visitor. and may not be copied in any manner. No image on this or any other page of this website may be copied or reproduced by any means without permission from the webmaster. 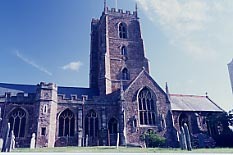 The present Parish and Priory Church of St. George dates back to 1443 although a church has stood on this site for at least a thousand years. Dunster Castle and park overlook Dunster Village on the fringe of Exmoor in west Somerset. Enjoy a leisurely stroll through the many charming shops along High Street or, perhaps, a more strenuous walk to the landmark Conygar Tower. "Dunster" a Limited Edition print by Maurice Bishop and other wonderful items of artwork are available at Castle Gate Gallery and other fine shops in Dunster. 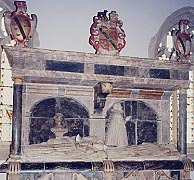 In the Priory Church are monuments and effigies of the first members of the Dunster Luttrell family. Interior and altar of St. George's Church. 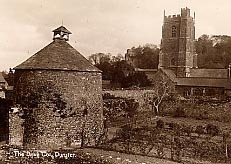 A vintage postcard print of the Dovecote which was purchased in 1539. 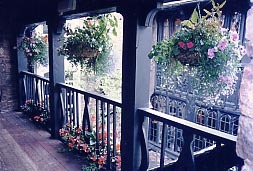 Enjoy the balcony overlooking the central courtyard of the Luttrell Arms. 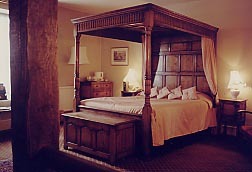 One of the 28 available rooms in The Luttrell Arms.